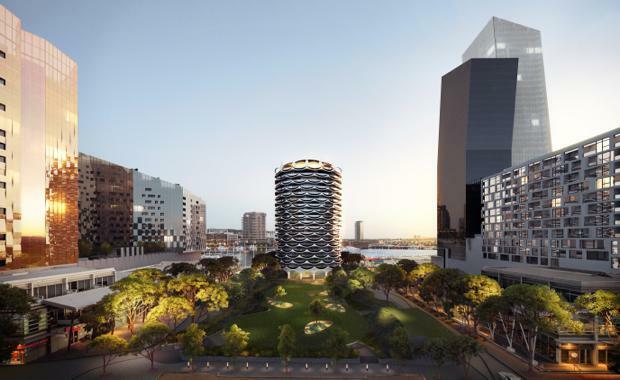 The transformation of the Dockland’s NewQuay precinct is set to continue with the introduction of a 4,600 square metre park set around new residential development, Banksia. The $18 million Ron Barassi Snr Park, a state government initiative, will open this year and feature a football oval overlaid on two full-sized soccer fields, netball courts, play equipment and a community pavilion. It will provide further amenity for residents at Banksia, part of the $140 million NewQuay project developed by MAB Corporation Founder and Executive Director Andrew Buxton. Located on the edge of Victoria Harbour, Banksia will comprise of 108 apartments across 18 levels, including one to four bedroom luxury residences. “Banksia and public spaces like this new park provide a boost to not only NewQuay but the Docklands as a whole, helping to fulfil its potential as one of Australia’s prime waterfront locations,” said Mr Buxton. Banksia apartments will include features like expansive balconies, large entertaining areas including big kitchen and step-in pantries, as well as walk-in robes and master bedroom ensuites. Features in the sky homes and penthouse apartments include a dedicated lift, separate laundry with in-built appliances, butler’s kitchen with a wine fridge and caterer’s cooking facilities, lock-up garages, piano room, fireplace, separated living areas with their own outdoor terraces, and ensuites overlooking the water. All residents will have access to the Banksia Club which includes a bar, grand piano room, business facilities, gymnasium, and a spectacular roof garden with BBQ outdoor dining areas, and spa pools. Expressions of interest are now being taken. The display suite will be open in July and will be located at 24 NewQuay Promenade, Docklands. Construction is expected to commence in late 2016 and is due for completion in early 2018.